Archive for category: New Affiliation! You are here: Home / Gary’s Blog / New Affiliation! 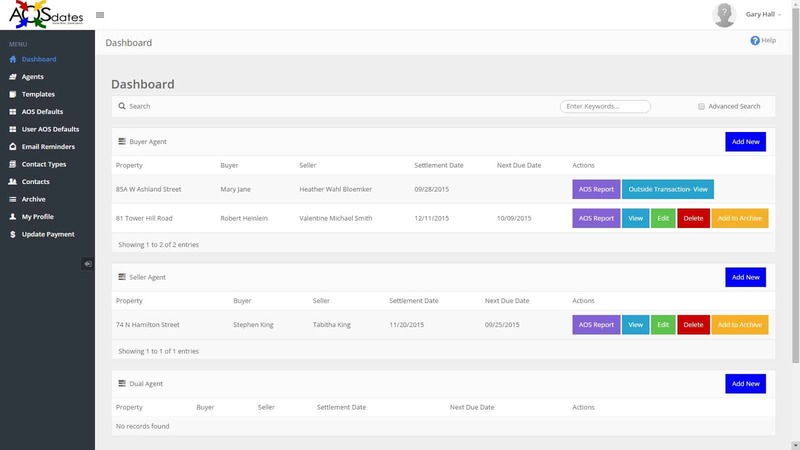 I am proud to announce that I am the first reseller for Referral Maker CRM from Buffini & Company. They have been using and marketing it primarily to their existing coaching clients for a couple years but now they are ready to let everyone take advantage of their unique CRM. You can tell from the start that Referral Maker is different. They don’t call them contacts. They call them relationships. Referral Maker is all about knowing your contacts inside and out and working them to increase referrals. Or you can just hope for new business all the time, something Buffini refers to as Transactional. Which one is more desirable? It goes well beyond categorizing people as buyers, sellers, prospects, suspects, past clients, etc. You rate their propensity to refer you. You can record their hobbies, favorite restaurants, sports teams and many other data points that enable you to do much more personalized marketing than just sending out another email drip campaign. So this CRM is geared towards capitalizing on your existing relationships vs focusing on Internet leads. So if you are very much into the latter, this one may not be for you. It is also not, currently, for someone who wants to use their CRM for transaction management in great detail. I often have agents tell me that they really just want their CRM to track their people and keep them following up in an organized way. That’s this one to a “T”. There used to be a few software applications whose only objective was to help you set goals and track them. Referral Maker ties that kind of thinking into a CRM to actually track and prompt those goals you have set. 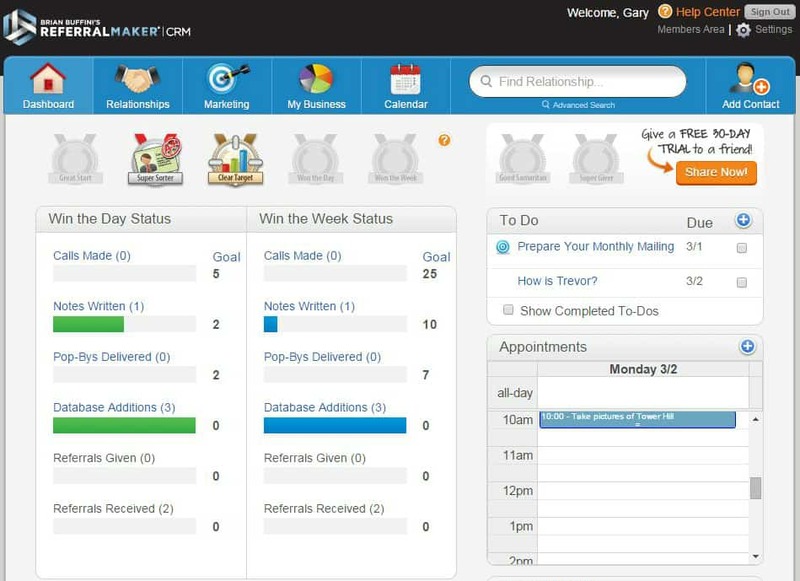 If you need a CRM and you like goal setting, Referral Maker is unique in its approach and should definitely be on your short list, at the top. Around June 2015 I contacted the Buffini organization to inquire about affiliating with them to re-sell Referral Maker. It was a pleasant surprise when I eventually ended up talking to Brian Wildermuth who is now their VP of Business Development. I know Brian from 2008 when he owned Sharper Agent and we were affiliated for resales. Brian suggested I join them in Philly for the Success Tour last week and I’m very glad he did. I started in real estate in 1987. There was no internet that provided a plethora of free training information like there is now, so I spent a small fortune on seminars, books, tapes and more. I read so many books and listened to hundreds of hours of Tommy Hopkins, Denis Waitley, Steve Stewart, Zig Ziglar and so many more. I even did the Firewalk with Tony Robbins. That was something I’ll never forget! But yesterday I witnessed first hand why I have heard so many positive comments over the years for Buffini and Company. Wow what an impressive production and just a great overall experience. I now have a much better perspective with which to view their Referral Maker CRM. Buffini made some great points in the context of Internet Leads versus nurturing your database for referrals. If you’re like me, if you haven’t experienced it yourself you’ve heard many disparaging words about internet leads. Namely, that they are either bad leads, or that there are too many, with few that result in a closing. Buffini’s teaching is that it is far less time consuming and much less expensive to work your database than it is to always go after new business using lead generation solutions and social media. And that is the thought behind the CRM. It’s about nurturing your database and that’s how it is set up. But what makes it unique is that with all the other CRMs, you are pretty much on your own unless you want to pay someone like me to coach you how to best take advantage of your CRM. With Referral Maker, you can buy just the CRM, or you can buy into a whole philosophy and be coached all along the way to make the best use of it. If you have been trying to use a CRM but keep failing, this may be an alternative worth considering. For more information, a trial, or to purchase referral Maker, please click here. This one is strictly for agents in Australia because much of the terminology is unique to Australia and North American agents would not find it comfortable for them. The process is pretty much the same but the terminology is all different. The first step in getting a listing is getting an appraisal which we would call doing a CMA. Customers are called vendors. There are always attorneys involved which are referred to as solicitors. I’m not saying that a North American agent could not use it. I’m just saying that others are better suited to our needs. That said, Australian agents, I really like the way this is laid out. It’s very process oriented with specific follow-up plans for each step of the listing, closing, and post closing. It has a unique look which is readily seen on the home page/desktop. If you’re in Australia and you’ve been looking at all these CRMs for Europe and North America, I would strongly recommend you take a look at this one here.